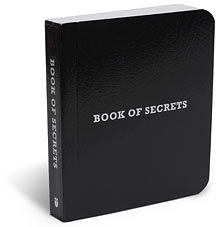 ThinkGeek is currently hawking The Book of Secrets for your favourite paranoid conpiracy lover. It contains all sorts of tidbits about clandestine undertakings such as secret daily flights between the US and Cuba and secret government experiments on the unsuspecting public. In addition, it also contains secrets to making your life easier, by getting free flight upgrades and public speaking. Best of all, it's small and easy to dispose of if THE MAN closes in on you.